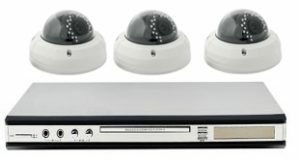 We provide a wide variety of surveillance options for you. From more simple systems in your home to monitor usage or a possible disturbance, to the more advanced HD video quality needed in a commercial setting. One of the big discussion pieces in looking at surveillance is looking at the benefits of IP (internet protocol) over analog cameras. When looking at cameras it is easy to focus on the system in which you can view the images collected. However it is important to really look into the resolution of the images captured. Analog cameras capture their images on TB lines. Which is the how many lines are on the screen of the recording. Most TBL images range from 420 to 700. IP resolution is much higher as it uses megapixels. A 1.3 megapixel image is exponentially larger and more clear than a 700 TBL image. IP is a good tool to have as well if you will need to zoom in on your image and want to see details in that image. There are cases, of course, where you will not need this type of image. Most ATM’s use analog imaging because they are capturing images in under 3 feet. Analog is also fine for most indoor surveillance needs. IP is very helpful in outdoor spaces where you may need to see facial features, vehicle make and model, and license plates. After looking at your needs and what options may be a good fit, this is where we can really come in to assist you. At Redlands Alarm, our technicians are set up to help you accomplish your security goals.We can help consult and where are the best spots to layout your surveillance cameras as well as help you decide on what lenses will be best for you. Often you can use multiples of the same camera with just changes in the lense, whether short range or wide lense to help cover all your bases.